ROME – Pope Francis railed against human trafficking, once again labeling it a “crime against humanity” while addressing a Vatican-organized conference in Rome on the issue April 11. The pope’s address came at the end of a three-day long conference organized by the Vatican department for Migrants and Refugees to discuss the implementation of the group’s “Pastoral Orientations on Human Trafficking,” which were published in January at the pope’s behest. The international conference brought together some 200 participants, including some of the world’s leading activists and organizers on the issue. The conference explored the issue in depth, with particular attention to trafficking in the context of sexual exploitation, slave labor, smuggling and the organ trade. The pope’s passion for human trafficking has led him to repeatedly condemn trafficking in all of its forms throughout his six-year papacy and it is widely perceived as one of his signature issues of concern. Most recently, the Vatican announced that the pope has selected Italian Sister Eugenia Bonetti, MC, a leading crusader against trafficking, to pen the reflections for Good Friday’s Via Crucis for the annual Holy Week liturgies. Pope singled out the work of religious men and women for their work in this area. 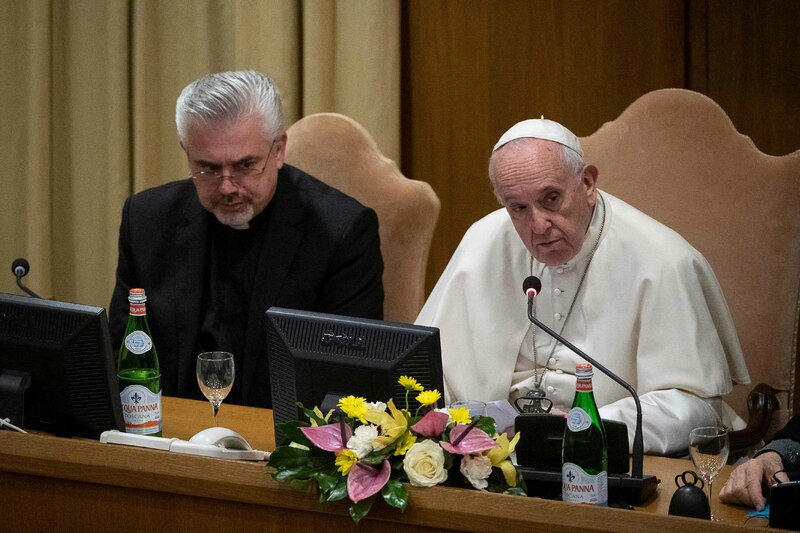 “I feel I must express special thanks to the many religious congregations that have worked and continue to work in this field, even online, thus acting as the ‘avant-garde’ of the Church’s missionary action against all forms of trafficking,” he said to applause. The pope also said the Church should use its extensive network and expertise in the area of anti-trafficking to collaborate both internally and with others involved in the same fight outside of the Church. “To make its action more adequate and effective, the Church must learn how to welcome the help of other political and social actors,” he added. Before his final summation, the pope once more derided the commodification of the human person brought about by trafficking activities.